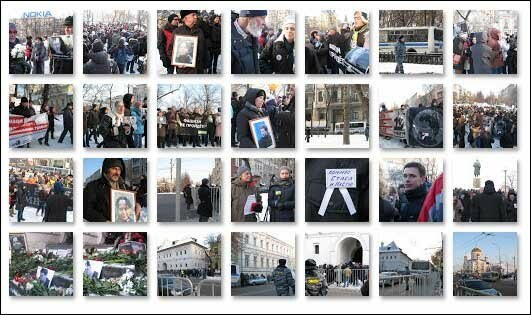 On 19th January 2013, the lives of lawyer and human rights activist Stanislav Markelov and Novaya Gazeta journalist Anastasia Baburova, both killed by neo-Nazis four years ago, were commemorated in Moscow. The march, organized by the ‘January 19 Committee’, began at the Pushkin Square end of Tverskoy Boulevard and continued all the way to Nikitsky Gates. After some difficult negotiations, Moscow authorities had agreed to a march consisting of 700 participants, but HRO.org’s correspondent estimates that at least 1000 people took to the streets. Nevertheless, the Russian Ministry of Internal Affairs said they counted only 500 protestors. Participants carried flowers, placards, banners and photographs of Stanislav Markelov and Anastasia Baburova. Slogans included “We remember Stas and Nastya” and “Remembering means fighting”, and protestors chanted the words “Fascism will not pass” and “We will not forgive; we will not forget!” Among them were some famous faces, including Grigory Yavlinsky, the founder of the Russian liberal party ‘Yabloko’; Ilya Yashin, co-chair of the Russian political movement ‘Solidarnost’; Aleksandr Cherkasov, member of the board of the Memorial Society, and Yelena Sannikova, former Soviet political prisoner, among others. The activists were accompanied the whole way by police officers, anti-riot squad vans and police vans. When the demonstration arrived at its official end-point (No. 12 Nikitsky Boulevard), everybody put away their banners and placards. The ‘January 19 Committee’ had previously given notice that the protest would march all the way to Kropotkinskaya metro station, but Moscow city council had refused to permit this. As a result, protestors continued as far as the building on Prechistenka Street where the murder had been committed, now carrying only portraits and funeral bouquets. Flowers and lit candles were laid out here. The protest ended without incident. Stanislav Markelov and Anastasia Baburova were shot on 19th January 2009 on Prechistenka Street, immediately after Markelov had given a press conference at the Independent Press Centre. A jury at Moscow City Court found nationalists Nikita Tikhonov and Yevgenia Khasis guilty of this crime. According to the verdict, their motive was Stanislav Markelov’s participation in the anti-fascist movement and his professional involvement in the defence of anti-fascists. On the basis of this verdict, Moscow City Court sentenced Tikhonov to life imprisonment and condemned Khasis to 18 years in prison.